Dimensions: 8 x 8 in. 40 pages. For all ages. Hardcover. 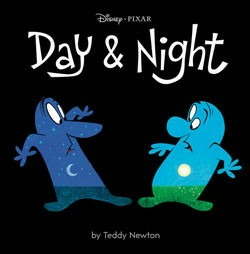 Day meets Night and Night meets Day in this delightful picture book based on the Pixar short, Day & Night, which premiered with Toy Story 3 in 2010. Kids will delight in the way these two characters explore their differences and eventually realize how much they like and enjoy each other. A wonderful way to experience the magic of this Pixar short again and again and rejoice in the attraction of opposites!